Have you ever brewed a whole pot of coffee for yourself and ended up with a lot left over? Only about a million times, right? We just can’t help but brew a whole pot. It wakes us up and smells oh so good. On the other hand, it’s almost criminal to waste great coffee, so we found a few ideas for how to put it to good use instead. 1. Place the Anaheim, jalapeno, and Polanco peppers on a baking sheet. Slide under the broiler and char all over. Immediately place the peppers in a large re-sealable plastic bag and steam for 10 minutes, loosening the skins. Peel the skins away and discard, along with the stems and seeds. 2. In a food processor, place the roasted peppers, chips, chipotle peppers with the adobo sauce, and the juice from the diced tomatoes. Pulse until smooth. 3. In the meantime, you’ve rendered the bacon in a large pot or Dutch oven and have set the crumbles aside. Pour the grease out of the pot and add the beef to brown. Once browned, remove from the pot and set aside. 4. Add the onions and garlic and sauté until tender, 4 minutes. Add the coffee and tomato paste and cook until the coffee cooks down and thickens, just a few minutes. 5. To the pot, add the beef, all the spices, vinegar, diced tomatoes, beans and the pureed mix. Simmer for at least an hour, and up to 5 million. Taste it. Go ahead and add some salt! If it’s too spicy, add some honey or a little more sugar. Keep simmering until your head wants to cut itself off and jump in. 6. Finally, stir the bacon crumbles back in, because glory be. 7. Garnish with cheese, sour cream, cilantro, avocado and corn chips! 2. Recipe number two is a Chocolate Coffee Layer Cake created by Completely Delicious. Let’s face it. Few things go better together than chocolate and coffee. It’s a match made in Heaven for sure. Here’s an idea for pairing them that will use up that leftover coffee in a snap. 1. Preheat oven to 325 degrees F. Line two 8-inch round cake pans with parchment paper and grease with non-stick cooking spray or coat with butter and flour. 2. In a medium bowl, whisk together the cocoa, sour cream and hot coffee or water until smooth. Set aside to cool. 3. In a separate bowl, combine the flour, baking powder, baking soda, and salt. 4. In the bowl of stand mixer fitted with a paddle attachment, beat the butter and sugars together on medium high speed until very light and creamy, scraping the bowl down as necessary, about 5-7 minutes. Add the eggs one at a time, mixing after each. Add the vanilla. 5. Add the flour mixture in 3 additions, alternating with the cooled cocoa mixture, ending with the flour mixture. Mix until just combined. Divide the batter equally between the prepared cake pans. 6. Bake, rotating halfway through. until the center of the cakes bounce back when touched and a toothpick inserted into the center comes out with a few moist crumbs, about 40-45 minutes. Let cool in the pans for 10 minutes, then remove to a wire rack to cool completely. 1. Whisk together the sugar, flour, milk, heavy cream and espresso powder in a medium saucepan. Set over medium heat and bring to a boil, stirring occasionally. Continue to cook, stirring constantly, until mixture is thickened, about 8-10 minutes. 2. Pour mixture through a mesh strainer into the bowl of a stand mixer fitted with a paddle attachment. Beat on medium high speed until cooled to room temperature, about 10 minutes. 3. Reduce the mixer speed to medium and add the cubed butter a tablespoon at a time, letting it become incorporated before adding the next tablespoon. Once all the butter has been added, add the vanilla and beat on high speed until buttercream is thick and creamy. If buttercream is too soft, chill in the fridge for 10 minutes, then try beating again. 1. If desired, cut the cooled cake layers in half, creating 4 layers. Place the first cake layer on a cake stand or plate. Cover with ¾ cup of the buttercream and top with another cake layer. Repeat. 2. Cover the layer cake with a thin layer of buttercream to create a crumb coat. Chill cake for 10 minutes to set, then cover with remaining buttercream. Chill for at least 30 minutes. 1. Place the chopped chocolate, cubed butter, and corn syrup in a large heat-proof bowl set over a pan of barely simmering water. Stir as mixture melts. Once smooth, remove from heat and let cool for about 5 minutes. 2. Pour about ½ cup of the ganache over the top of the chilled cake, spreading it just to the edge without letting it spill over the sides. Chill 5 minutes. Pour another ½-1 cup of the ganache over the cake, this time pushing it over the sides and letting it drip down. Let cake set for 30 minutes at room temperature or 10 minutes in the fridge before serving. For additional tips on how to perfect this one, visit Completely Delicious. 3. Finally, here’s one that’s more of an ingredient than a complete dish or dessert. It’s also as simple as it gets – and will add a whole new level of yumminess to dozens of food and drink favorites. It’s called Leftover Coffee Ice Cubes. Simply fill ice cube trays with your coffee and place them in the freezer. You can never have too many of these, so visit the Dollar Store and stock up on trays. This idea comes from Listotic – Listed and Loved. 3. Add them to your favorite creamed liquor. Offer your guests some Bailey’s on coffee rocks. 4. Substitute them for regular ice cubes in your morning smoothie. You’ll get a richer taste and caffeine kick. 5. Pour the coffee into popsicle molds and treat yourself on a hot and sticky summer day. Want to treat your taste buds? We have just the thing: The Grande Kaffé Collection. It’s available in over 20 flavors and is packaged in convenient one-pound bags. The best part is that you can order online and have your coffee delivered as soon as the next day — direct to your door. It doesn’t get any better than that. 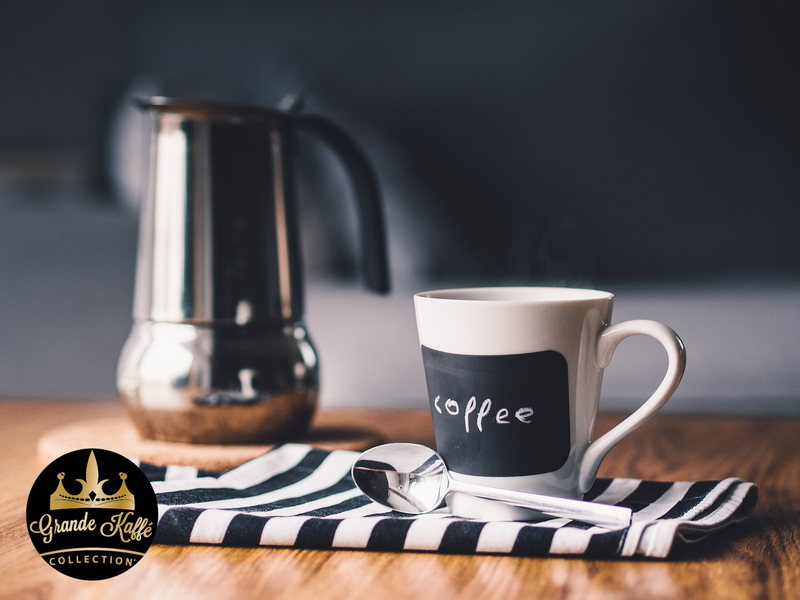 Check out our featured coffee flavors and place your first order today. Leftover coffee never tasted so good.